Delivery is normally less than 30 days, 2 year warranty. Operating temp is (0 to 60C) with optional batteries are premium. We have High temperature Batteries available. The standard internal battery pack is rated @ 1920VAhr Sealed Lead-Acid VRLA. Order 2ea. PSrbc44 or PSrbc44H for replacement. 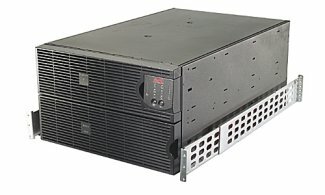 Dual conversion UPS mode is standard for this workhorse. Military connectors are installed upon request. Allows computers with 50/60Hz operation to deploy overseas. Intelligent UPS; the built-in self test checks UPS and battery condition every 2 weeks and is configurable for the test interval. Audio alarms as well as LED and networked indicators. SNMP uses the world famous Powerchute software standard. Dual pole circuit breaker- 120G breaker on Mil- 1399 configuration if needed. EPO Emergency Power Off- simple low power wiring can shutdown the output completely. Intelligent ruggedized packaging- it can survive being bolted onto a HMMWV! We build them tough. Multi-LED array display monitors the input voltage from the front panel. Front panel also has LEDs indicators for Online, On-Battery, Bypass mode, Fault, Overload and Replace Battery indicators. The firmware is upgradeable in the field if needed. Rack-mount rails, RS232 cable and Manual are included. Jonathan slide is available. The following back panel is standard for PS10000- 2ea. L6-30, 2ea. L6-20 and 2ea. external battery connectors. Also, terminal blocks are included for Hard Wiring input & output. 4 rear mounted circuit breakers protect the outlets. --- Powerstar has optional back plates for this unit. Canon connectors optional. PS10000i back panel has 4ea. IEC320-c19 16A connectors and a breaker for each as well as 4ea. IEC 320-C13 10A connectors with 1 breaker to protect them. Terminal block input and output also included for Hardwire/conduit installations. Batteries are installed in 4 metal trays and slide in to the front of UPS. This makes the packs very easy to replace. External battery connector on back panel included if you want to add more. 1920VAhr. standard battery pack gives 13 minutes runtime @ 4000W load or 4 minutes @ 8000W. Additional battery Racks available from Powerstar, just plug in as many as you need. -- i.e., PS10000 + 1 additional rack gives 28 minutes @ 4000W 11 minutes @ 8000W total. -- PS10000 + 2 additional PS10000-BP will run the unit 46 minutes @4000W 20 minutes@8000W.